This impressive gold medallion can be personalized with up to three letters of your choice, resulting in a piece of jewelry that is truly original. The Monogram Medallion Pendant in 14K White Gold is a charming accessory that can be dressed up or dressed down, depending on the day. Either way, people will be amazed at the quality of the beautiful lettering at the center of the pendant. This gold medallion measures 32mm by 32mm (not including bale), which is the perfect size for such a beautiful piece, allowing its full detail to be appreciated. At the center of the pendant are three initials written in a decorative script that is both playful and artful at the same time. The curves of the letters join the round ring of the medallion, making one solid, 14k gold piece. The overall pendant is shined to a high polish, bringing out the lustrous color of the white gold. A bale attaches to the top of the pendant for a chain. This pendant is a wonderful example of a classic piece of jewelry. It is a gold monogram that is subtle enough to wear every day, and a piece that you will never tire of. Pendant measures 32mm (1 +") x 32mm (1 +") not including the bale. Total Length of pendant is 43mm (1 11/16") including the bale. 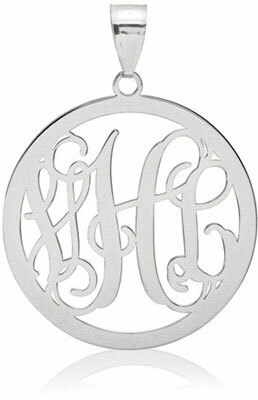 We guarantee our Monogram Medallion Pendant, 14K White Gold to be high quality, authentic jewelry, as described above.